Amore's Tournament-clinching entries consisted of two of the simplest, yet most overwhelmingly tasty pizzas we've had to date. 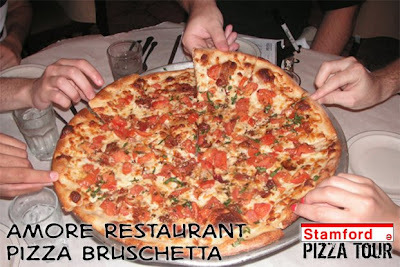 We began with a house specialty pizza Bruschetta, featuring fresh tomatoes, sliced mozzarella, crispy bacon, crushed garlic, and basil with a perfectly-seasoned light sauce atop a golden brown, crisp, delicious crust. Halfway through demolishing this pie, Al, the owner, came by and dropped off a small pizza Margherita, his specialty, admitting that his Bruschetta was "ultimate," but his Margherita, with tomato, fresh mozzarella and basil was still better. Elliot: "Good crust: crunchy and cooked to perfection, tomatoes are off-the-vine fresh, ingredients work so well together. Awesome." Kait: "Bruschetta was amazing. Extremely fresh, great sauce, great atmosphere, very friendly." Allison: "Bacon = excellent addition, liked Bruschetta better than Margherita, but both were excellent." Scott: "Excellent sauces, cheese is incredibly fresh, crust is absolutely perfect. Huge, fresh, clean flavors make a near-perfect pizza"
Well, there you have it. 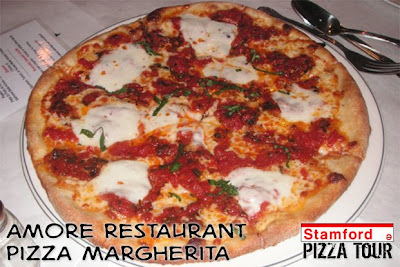 We at the Stamford Pizza Tour can confidently say that the very best pizza in town comes from Amore Restaurant, and while we're torn between the Bruschetta and the Margherita pies, it seems they can do no wrong because both were extraordinary. We were blown away by this establishment when all we did was walk in and order a simple, classic cheese pizza (half plain/half sausage, as per usual) on the Tour, only to be reassured of our choice with a quiet, confident, "I don't think you'll be disappointed." We certainly were not, and we know that you won't be either. When you show up to Amore in droves, clamoring for the very best pizza in the city, tell them the Stamford Pizza Tour sent you. Buon appetito! Great job guys, I've really enjoyed following the blog and will miss the updates. Hooray, Amore! 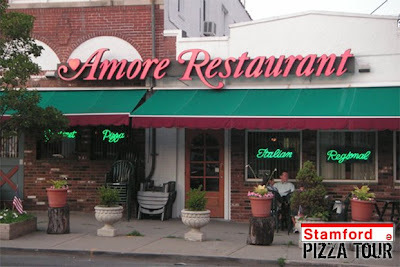 I've lived in Stamford forever but I'd never tried Amore before reading about it here. Indeed, we were *not* disappointed when we went last week (to an almost empty restaurant on a Friday night! People, go to Amore! ), and I am thrilled they came out on top.